Heat oil in oven proof skillet and saute onions for a couple minutes and then add the leeks. 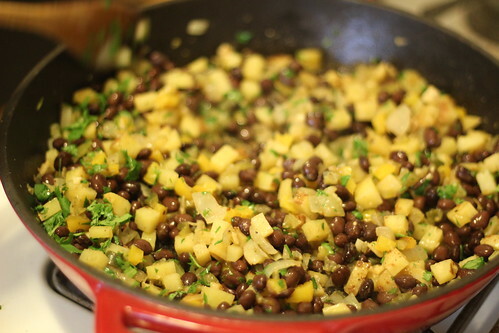 After another minute add the garlic, cumin, coriander, potatoes, and peppers. Saute for a couple minutes and add the lime juice/zest, tomatillos, tomatoes, salt, and pepper. Continue to cook, stirring periodically, for about 8-10 minutes. 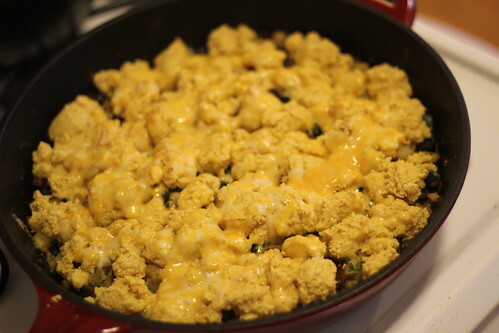 Preheat the oven to 375 and prepare the cornbread topping: sift together the dry ingredients. Whisk together egg and yogurt and mix into dry ingredients and set aside. Stir beans and cilantro into skillet and top with cornbread batter. Bake at 375 for 15 minutes. Add shredded cheese and return to oven for 3-5 more minutes, until golden and browning on the edges. Modifications: I didn’t use any tomatoes because we didn’t have any, and we had also just used the all the leeks in the soup the night before, so we didn’t include that. Notes: This was kind of blah. Definitely should use more cheese than is called for. I think the cornbread is a little too dry and crumbly for this kind of dish, it would have been better with a fluffier dough I think. Oh well, we got some lunches out of it and it used up a lot of veggies. Looks like scrambled eggs with cheese! 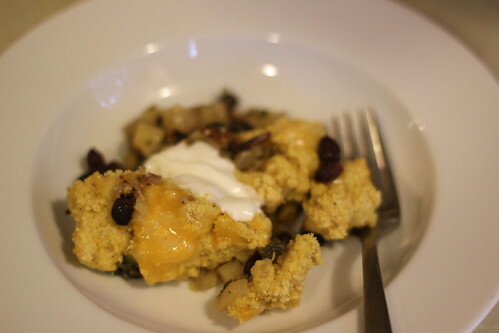 This entry was posted in black beans, cheese, cilantro, cornmeal, csa, eggs, garlic, leeks, lime, one dish meal, onion, poblano pepper, potato, red pepper, tomatillos, tomatoes, vegetarian. Bookmark the permalink.